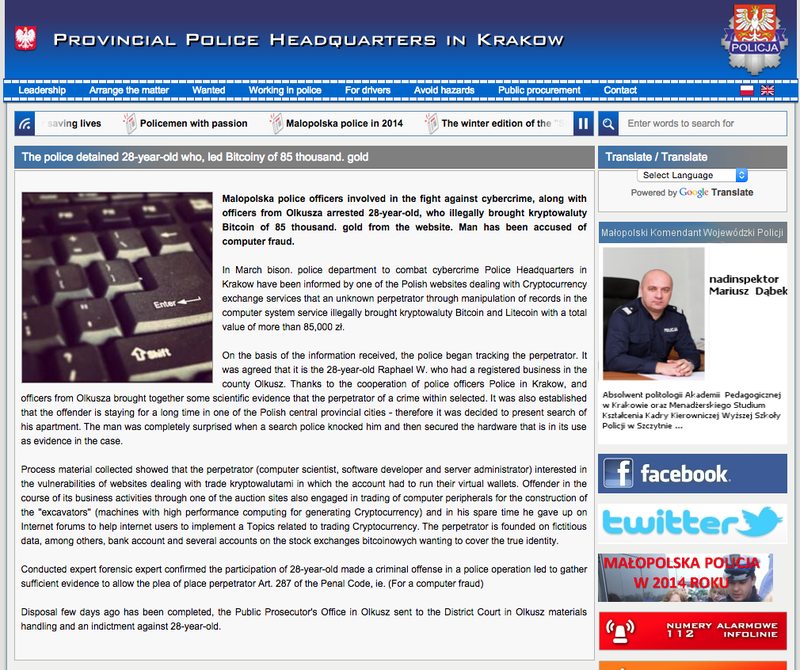 Working from a tip off, the Cybercrime Unit began tracking the perpetrator and subsequently arrested computer scientist ‘Raphael W’ – who according to the police manipulated the BitMarket software to illegally withdraw around 85,000 Zloty or £15,000 Sterling. The official notice was posted on the Provincial Police Headquarters website but was unclear with regards to how exactly the theft took place and what has happened with the money. The perpetrator was arrested for breaking the Computer Fraud Act – Art. 287 of the Penal Code with a maximum imprisonment of five years in jail. Customers of the Polish Bitcoin exchange recently voiced concerns regarding the theft of coins from their wallets. The exchange recently lost their banking partnership with Bank BPH. CoinSpectator has reached out to Polish Cybercrime Unit and awaiting a reply.